Learning to like Sushi: Campaign for a new Mac Book!! Anyway, I guess I will start with what we've done lately and then work backwards over the last few months until I'm caught up! Here I go!!! 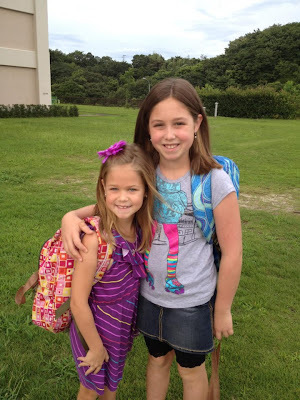 Monday, August 27th, was the first day of school for the girls. Hannah started 5th grade and Elliot started 2nd. Like every parent says- " I can't believe they have gotten so big so fast. Where did the time go?" We ordered special first day of school outfits a month before school started, but they didn't arrive in time, so instead we dug through their closets to find something " semi new" to sport on the first day. I don't think we did too shabby! !